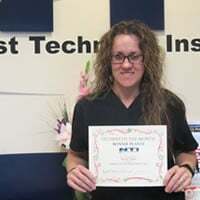 Medical Coding & Billing student Bonnie Plante is awarded Student of the Month at the Scarborough campus. Bonnie originally came to us as a Medical Coding student. With her bubbly personality she realized that Medical Assisting was the program for her! Bonnie is responsible, thoughtful and hard-working. She has been very motivated throughout the program and comes eagerly to class to participate in classroom discussions and lab activities. Bonnie lives in Waterboro with her husband and two beautiful children. She has worked hard to be a positive role model for her family…and it shows! Congratulations Bonnie, you earned Student of the Month for March 2017!